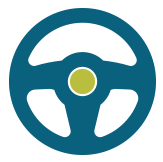 Motor vehicles were first registered in June 1905. Individuals made their own plates, and registrations were recorded with the Secretary of State. The plates were made of leather with metal numbers. This practice continued until 1915 when the Department of Motor Vehicles began issuing the plates. The Department assigned numbers to the plates, which were then made of metal. 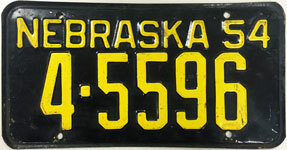 From 1915 to 1939 the plates were two colors, which changed every year. 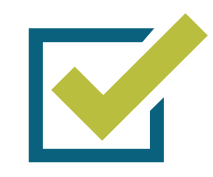 In 1922, the state established the practice of using prefix numbers to identify the counties in which vehicles were registered. Each county was assigned a number based on the number of registered vehicles in the county at that time. The county with the most vehicles, Douglas, was assigned the number 1; the county with the second highest number of vehicles, Lancaster, was assigned number 2; and so forth. 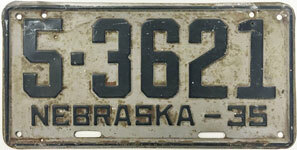 From 1903 to 1920 only a single plate was issued for each vehicle. 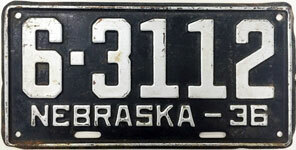 In 1921 two plates were issued for each vehicle. 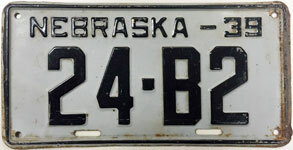 Except for 1920, plates were issued annually until 1943. 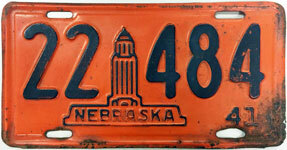 In 1942 the plates returned to two colors, changing annually. A metal revalidation tab was issued in the years 1920, 1943, 1944, 1947, 1953 and 1959, but after 1960 the tabs became a decal-type material. In 1952 to 1955 the Goldenrod was added to the plates. 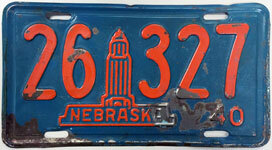 In 1966, special reflective sheeting was used while numbers were stamped and painted on the plates. In 1940 - 1941 the Statehouse Emblem was added. 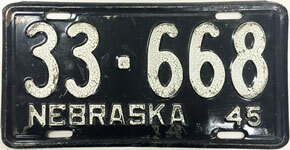 Beginning with the 1956 license plates, a slogan “The Beef State” was embossed on the plates and remained until 1965. 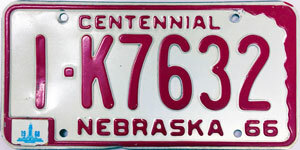 In 1966, the word “Centennial” was embossed on the plates in honor or the States Centennial Celebration in 1967 for the license plate series expiring in 1968. 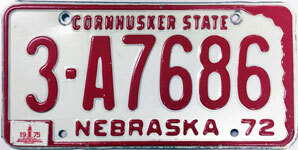 In 1969, the slogan “Cornhusker State” was embossed on the plate until 1975. 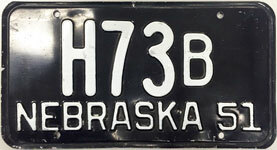 In 1976 a bicentennial plate honoring the United States Bicentennial was issued to all passenger vehicles. 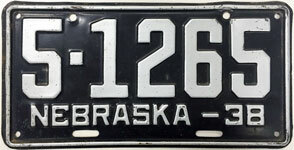 It had the word “Nebraska” on a red banner at the top and the slogan “1776 Bicentennial 1976” on a blue banner at the bottom. In the upper left and corner was a blue sketch of a covered wagon and in the upper right-hand corner was a blue sketch of a Native American Chief. 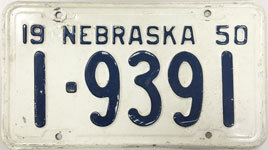 Beginning with the 1984 blue on white license plate with no slogan or graphic design, plates were to be reissued every three years. 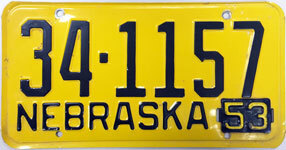 In January of 2002 the State began with issuance of the Alpha/Numeric License Plates. 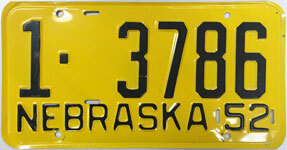 These plates are issued to residents of the three largest counties, Lancaster, Sarpy and Douglas. 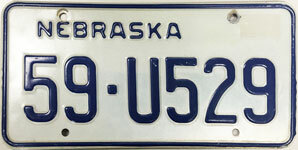 From 1962 through 2004, with the exception of the United States Bicentennial License plate series utilized from 1976 through 1983, new distinctive license plates were issued every three years. Starting with issuance of the 2005 plate series, issuance of new license plates changed from every three years to every six years. 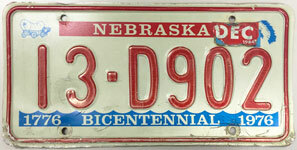 The reason for the long use of the Bicentennial plates series was the result of budgetary considerations. License plate production had been state general fund expenditure and to save funds, the then Governor and Legislators delayed that expenditure to save money. 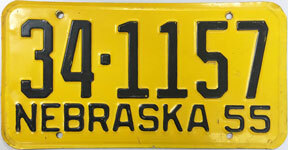 In 1972 the Nebraska Legislature authorized the State of Nebraska to issue Message plates. 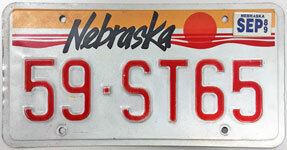 The State of Nebraska began issuing special Husker Spirit Plates in January of 1997 on behalf of the University of Nebraska. 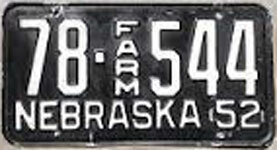 Plates were numbered in consecutive number order and issued in order as applications were received. 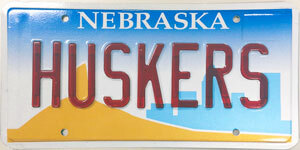 In January of 2000 Husker Spirit Plate were issued with messages. 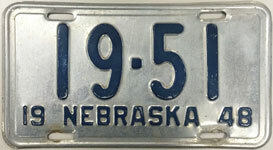 A new method of funding the license plate production began with the 1984 plate series. 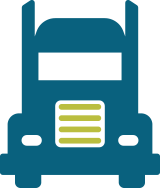 At that time, Highway Trust Funding was used to provide the upfront cost of materials and license plate production. 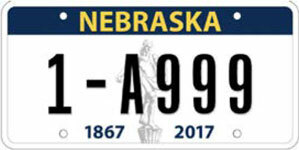 The Legislature established a fee to cover the cost of each license plate and its validation decals. The individual then paid that fee at the time a new plate(s) were issued. The fees collected were then provided to the Highway Trust Fund to replenish those funds. This process of plate funding continues to the present. 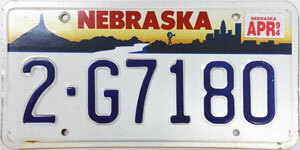 Issuance of flat digital license plates began in November 2003. Beginning with the 2005 issuance of license plates, reissuance will occur every six years. 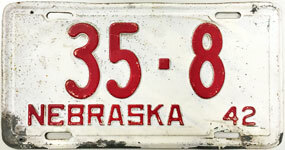 Issuance of full size trailer plates also began in 2005. 1903 - 1914 – Made with metal numbers by the individual and recorded with the Secretary of State. 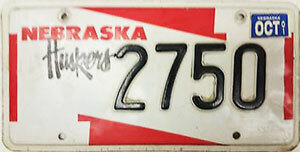 1997 – 1999 – Husker Spirit Plate – Huskers in italics with Iron N Red/White. 1999 - 2001 - Nebraska landscape Chimney Rock/city; Red on Rust and Blue Multi-color. 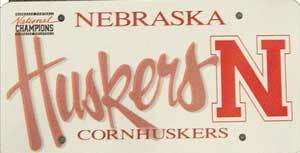 1999 – 2001 - Husker Spirit Plate – Huskers in italics with Iron N Red/White. 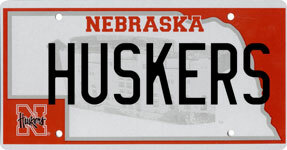 2002 – 2004 – Husker Spirit Plate – Outline of State with image of Memorial Stadium Red/White. 2011 - 2016 - Meadowlark and Goldenrod/forest green letters & numbers. 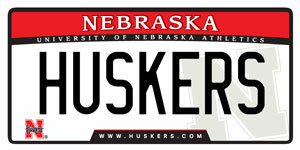 2011 - 2016 - Husker Spirit Plate - Red banner at top and bottom/white center, black letters & numbers, white N on left & right at bottom, words GO BIG RED! across the bottom.